That is a wonderful shot. The Tibetan colours are always incredible. Beautiful. I love the snow-part of this photo..
Nice effect with the longer exposure. Une photo zen, une photo que l’on prend plaisir à regarder longuement. Super ! 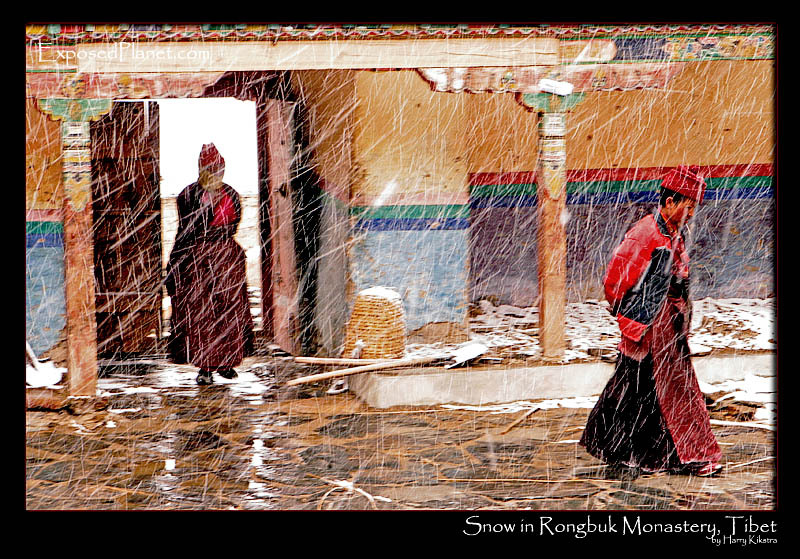 The story behind "Nuns in a snowstorm in Rongbuk monastery, Tibet"
The courtyard turned white within a few minutes, the snowflakes came down quickly. The nuns in the Rongbuk Monastery, the highest monastery in the world at 5000m altitude, were looking for cover. I tried to capture the snow with a long exposure, so that’s why it looks a bit surreal.. The courtyard turned white within a few minutes, the snowflakes came down quickly. The nuns in the Rongbuk Monastery, the highest monastery in the world at 5000m altitude, were looking for cover. I tried to capture the snow with a long exposure, so that's why it looks a bit surreal..